It’s no surprise to anyone that in these tough economic times, many people turn to their local nonprofits for help in meeting basic human needs. But the increased demands for help hit nonprofits at the same time that their own revenues are declining because of the economy. Nonprofits today are struggling with a number of issues including…. It’s a time where all businesses, including nonprofits, must closely examine where they can be more efficient in their day-to-day processes. More efficient in marketing to constituents, more efficient in processing transactions, more efficient in reporting to key stakeholders and more efficient at tracking and forecasting donations. Technology offers a number of options for nonprofits to implement those efficiencies through accounting systems such as Microsoft Dynamics GP, through customer relationship management to track communications to and activity from constituents, and other Microsoft technologies such as SharePoint. Plus, Microsoft also offers grants that help nonprofits better serve their communities. 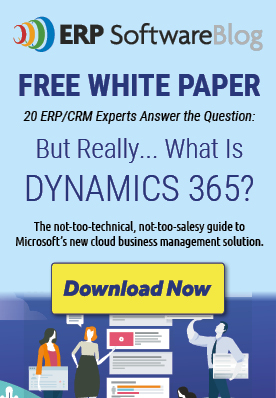 Should ERP Software Buyers Have Their Heads in the Clouds? All non profit companies (in SIC 83xx or 86xx) are eligible to buy 1 user of Microsoft Dynamics GP (Advanced Management OR Business Essentials) and get 2 users free. Expires December 23, 2009. Promotion code: NA-H1-10-04.